Leading Wholesale Trader of sphatik laxmi ganesh murti, shree yantra sphatik, sphatik ganesh statue, sphatik lakshmi murti, sphatik linga on brass stand and sphatik nandi from Varanasi. We are highly acknowledged organization in the domain, engaged in offering high quality range of Sphatik Laxmi Ganesh Murti. Our provided murti is carved using high grade raw material and different precise tools by our vendors’ artisans. 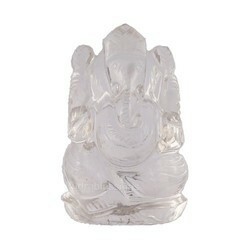 The offered murti is available in a variety of sizes, patterns and colors to cater the specific choices of our clients. Apart from this, our provided murti is highly demanded and appreciated by our esteemed clients. 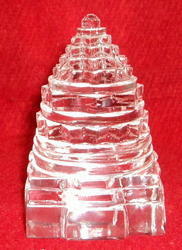 We are occupied in exporting 6 Shree Yantra Sphatik to our clientele. These products are made by vendors with the high quality of raw material that is bought from reliable vendors. Owing to diversity of designs and shapes, these products are highly admired in the industry. Moreover, we offer these products at very cheap rate. 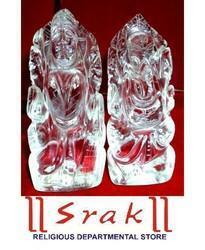 Our clients can avail a large gamut of Sphatik Ganesha statue in industry. These statues are finely carved in various sizes, designs, shapes and finishes as per the clients’ specific requirements. The materials we have used in fabrication of these statues are procured from some of the reputed and genuine vendors of the industry. We offer our products in varied specification and at affordable rates in market. moreover, our range is supplied within the committed time frame. We manufacture and supply Sphatik Lakshmi Murti that is a Murti like handcrafted item that holds radiant white light energy and reflects back rainbows. 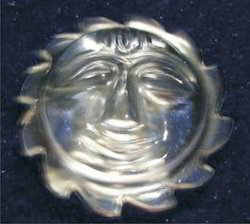 It is regarded as one of the most strong and powerful source of energy and prosperity. It is also regarded as the source of attaining all worldly desires that fulfills all of your wishes through the cosmic powers. 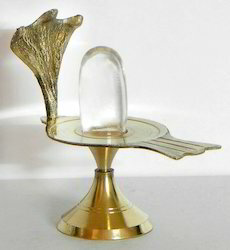 Our organization is engaged in offering a quality assured range of Sphatik Shiva Linga on Brass Stand for the market. These products are manufactured under the leadership of skilled craftsmen who have rich experience of this domain. Our offered products are widely appreciated in the market due to their excellent quality. Moreover, we make sure that these products are delivered to our patrons within the given period. Nandi is the "Vahana" (vehicle) of Lord Shiva. In ancient times, the bull was called "Nandikeshvara" and was represented as a strong man with a bull's head. It is also said that Nandikeshvara was a "Rishi" (Wise Man) who guarded the doors of Shiva's abode and thus became divine.According to Shaivite scholars. Backed by our experienced vendors, we are offering a wide range of Sphatik Shree Yantra. Our products are admired in the market for their classic look and précised designing. These products are accessible in diverse shapes and sizes, gorgeous designs and noticeable look. These products are obtainable light in weight. 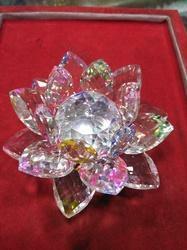 In order to carve noticeable position in the industry, we are offering a stylish range of Crystal Surya Dev. These are made at our vendors manufacturing unit by well-informed designers and craftsmen under the direction of industry professionals, these offered products are highly praised for their precise designing and superior finish. Moreover, our products are very light in weight and offered at small prices. 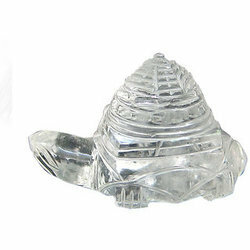 We also offer an exclusive range of Shree Yantra In Sphatik On tortoise. These decorative items are made using best grade raw materials, which are procured from some of the genuine and authentic vendors of the industry. We make sure that our range is free from any defect therefore our quality controllers keep an eye on all the ongoing production processes. Apart from this, our range is offered at leading prices in industry. We have emerged as one of the foremost distributors of the industry by offering an attractive assortment of Sidh Sphatik Shankh. These products are widely acknowledged in the market for their beautiful design and durable nature. permanent shine, accurateness and low prices. our vendors also check these products at industry parameters. An extensive array of beautifully carved Sphatik Kamal Sriyantra also be availed from us, which are available in varied shapes, sizes and other related specifications. Fabricated using optimum quality materials, these decorative items are ideal for placing in office, home or any other organization or increasing the beauty of the place. Our experts have carved these decorative items in innovative patterns, which attract the viewers. In order to carve noticeable position in the industry, we are offering a stylish range of Sphatik Mala Diamond Cutting . These are made at our vendors manufacturing unit by well-informed designers and craftsmen under the direction of industry professionals, these offered products are highly praised for their precise designing and superior finish. Moreover, our products are very light in weight and offered at small prices. 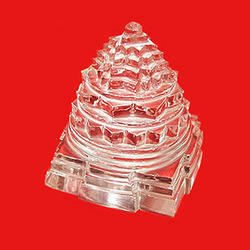 In order to carve noticeable position in the industry, we are offering a stylish range of Sphatik Shree yantra . These are made at our vendors manufacturing unit by well-informed designers and craftsmen under the direction of industry professionals, these offered products are highly praised for their precise designing and superior finish. 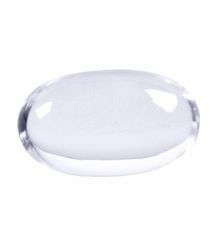 Moreover, our products are very light in weight and offered at small prices. 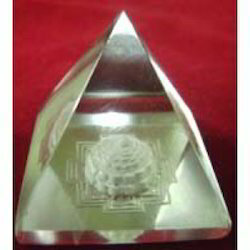 We also offer an exclusive range of Sphatik Shree Yantra in industry. These decorative items are made using best grade raw materials, which are procured from some of the genuine and authentic vendors of the industry. We make sure that our range is free from any defect therefore our quality controllers keep an eye on all the ongoing production processes. Apart from this, our range is offered at leading prices in industry. 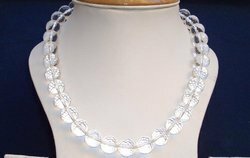 With our years of experience and knowledge, we are engaged in offering a wide range of Crystal Kachua that is elegantly designed by our experienced artisans. Keeping its head-part towards the worshippers its open part remains towards the right hand of the worshippers. In order to ensure quality of this shankh, our quality experts stringently examine this shankh on several quality parameters. Keeping in mind the different requirements of our clients, we provide this shankh in plethora of designs, patterns and styles. 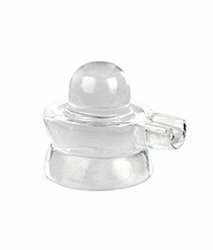 We have emerged as one of the foremost distributors of the industry by offering an attractive assortment of Sphatik/Crystal Shivling . These products are widely admired in market due to attractive look and standard designs. Our products are finished by industry vendors who have rich acquaintance in this field. Moreover, we offer our products in different specifications and inexpensive prices. 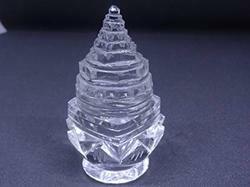 Our clients can avail a large gamut of Crystal Shivling in industry. These statues are finely carved in various sizes, designs, shapes and finishes as per the clients' specific requirements. The materials we have used in fabrication of these statues are procured from some of the reputed and genuine vendors of the industry. We offer our products in varied specification and at affordable rates in market. moreover, our range is supplied within the committed time frame. We also offer an exclusive range of Powerful Sphatik lingam in industry. These decorative items are made using best grade raw materials, which are procured from some of the genuine and authentic vendors of the industry. We make sure that our range is free from any defect therefore our quality controllers keep an eye on all the ongoing production processes. Apart from this, our range is offered at leading prices in industry. 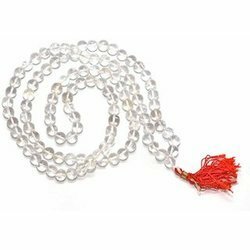 We have emerged as one of the foremost distributors of the industry by offering an attractive assortment of Sphatik Mala. These products are widely acknowledged in the market for their beautiful design and durable nature. permanent shine, accurateness and low prices. 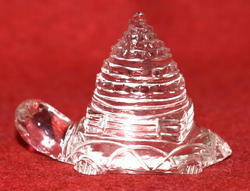 The Sphatik Shankh we have from half an inch onwards. Our product range is highly used across various temples and households for praying activities. These are worshiped as ancient, original, prehistoric and not merely as an abstract symbol. These all products are hand cut precisely at our manufacturing unit. 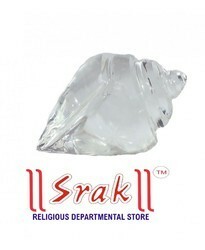 Our original Sphatik Shivling size ranges from half an inch and onwards. We retrieve our products out of best in quality raw material from the market reliable players. We also have enough quantity in our stock at all given time. We are able to manufacture and customize these product range accordance to your choice and specification. 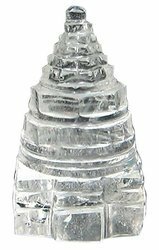 Another special feature of this Sphatik Lingam is that these are real sphatik crystal that are hand cut and are shaped into shiva lingas..